Many people today have lost a sense of how shocking the gospel of Jesus Christ truly is. Especially in a culture like ours, it is easy to become blind to the gravity of the healing and fulfillment of the human person that our Lord has brought to the world. That temptation is especially strong in a time and place where many confuse superficial acquaintance with Christianity with true discipleship. In contrast, the people in today’s gospel lesson had no difficulty in being shocked by the Lord. The Gergesenes were so terrified by Christ casting out the demons and sending them into the pigs, which then drowned in the sea, that they actually asked Him to leave their region. Think for a moment how totally unexpected it would have been for Gentiles to see the Messiah of Israel transform the lives of two of their own people in such a dramatic way. They were so unsettled by what had happened that they literally asked Him to depart, which He did. If we have received His mercy by faith, then we must extend His love and reconciliation to everyone. If we participate in His life through grace and not by our own accomplishments, then we must love and serve those who have not earned something in particular from us. If we truly believe that all peoples and nations may become one in Christ, then we must learn to treat even strangers as our neighbors and loved ones. We must dare to become living icons of the same outrageous generosity that we have received from our Lord and that extends literally to the entire world. That is what we seek to do on “St. Timon Sunday” in our Diocese of Wichita and Mid-America, when we take up a collection for the relief of our brothers and sisters in the Archdiocese of Bosra-Hauran in Syria. We do so today as we remember St. Timon, one of the seventy apostles sent out by Jesus Christ and one of the original deacons mentioned in Acts (Acts 6:5). St. Timon was the first bishop of what is now known as the city of Bosra, and he died as a martyr. 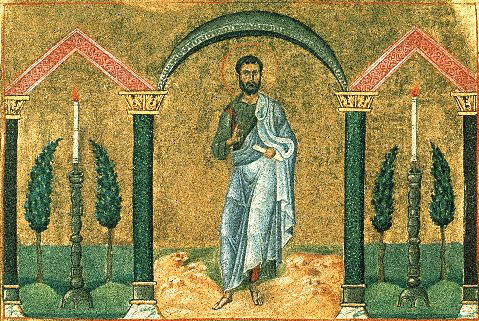 He played a key role in evangelizing a region where our Lord Himself often ministered (Matt.4:25) and where St. Paul took refuge after he escaped from Damascus following his conversion. (Gal. 1:15-18) All Christians, and especially Antiochian Orthodox, can easily trace their spiritual roots to this part of the world. At least 400,000 people have died in Syria since the start of the present conflict five years ago, and many millions have fled for their lives. Many clergy and laity have become martyrs and confessors for Christ. In the Archdiocese of Bosra-Hauran, many towns and parishes are now deserted. Thousands of refugees are seeking shelter in Sweda, where the cathedral of the Archdiocese is located. Under the guidance of His Eminence, Metropolitan Saba, the Church there is doing all that it can to help everyone in need. Divisions between people are growing greater today not only in Syria, but also in many parts of the world. We must remember that our Lord’s mercy extended to those who were considered strangers and foreigners to the heritage of Israel. St. Paul explained how Christ broke down the division between Jews and Gentiles, how are all one in Him and equally dependent upon His mercy and grace. If that is how we all have come to share by faith in the life of Christ, then how can we not share His love with everyone we can help, especially those with whom we share a common spiritual life? Remember that it is through the witness of the faithful in that region across the centuries that we have received the blessing of participating in the fullness of the Body of Christ. I know that we are all deeply troubled by the violence, persecution, and humanitarian crises of the Middle East. We often feel helpless before such great catastrophes and wonder whether we can do anything of significance in relation to them. Instead of fantasizing that we rule the world and can make problems vanish in an instant, Christ calls us to do what we can in order to convey His mercy to our brothers and sisters—and to do so with simple trust that He will work through our humble efforts in ways that we cannot fully understand. Remember that He delivered particular people, only two demon-possessed men, in today’s gospel reading. That should inspire us not to denigrate the small, focused offerings that we make today for relief in the Archdiocese of Bosra-Hauran. As with any other act of faithfulness in our families, our parish, or our neighborhoods, we can place no limits on what the Lord may do with them. He fed thousands with a little bit of bread and fish. He established His Church through the work of unlikely disciples with no power or influence in that time and place. He even conquered death through His Cross, which was the ultimate symbol of weakness, insignificance, and despair. But through it, He brought a shocking victory over death itself that extends to people of every generation who call on Him in humble faith. We can place no limits, then, on what God can do with any act of faithfulness on our part—even one that looks so small as to be pointless in the jaded eyes of the world. Our Lord is still at work casting evil out of broken humanity, both individually and collectively. He is still breaking down the stupid barriers that we build up against people who are different from others in superficial ways. And what He does is so shocking that some still ask Him to leave because they cannot tolerate any challenges to their idolatry of nationality, ethnic heritage, religion, politics, or something else. Of course, these are simply our pathetic attempts to justify ourselves, to build up our own righteousness on the basis of our petty characteristics and accomplishments. Trusting in Christ’s mercy, let us lay aside all efforts to justify ourselves over against others and instead become vessels of the shocking love that is the salvation of the world, poured out freely to all who call out to the Lord in humble faith. For if we have received His grace, then we must do what we can to convey His mercy to others, especially to our suffering brothers and sisters in the Archdiocese of Bosra-Hauran in Syria. Very timely, Father. Thank you.